How do I search a eukaryotic genome with BLAST? Begin typing the name of the organism (for example "American") to invoke the organism listing. 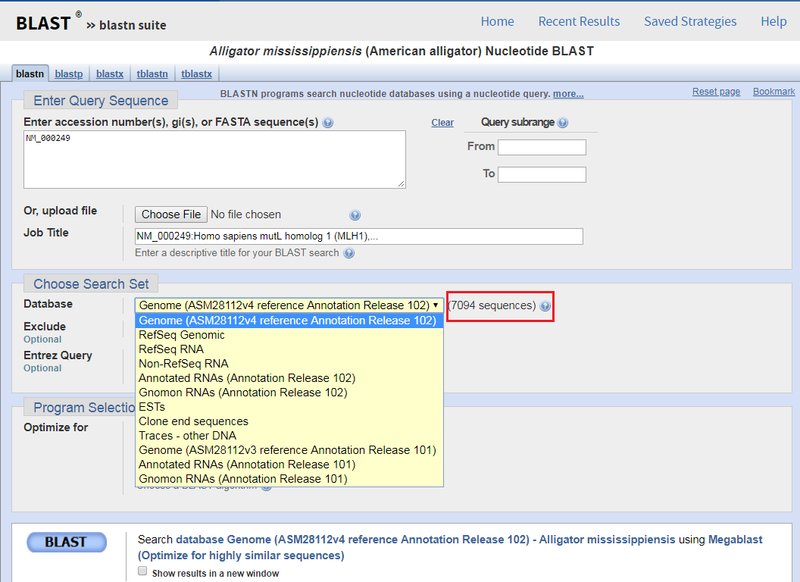 Select the matching name (taxid) for the organism from the listing, for example "American Alligator (taxid: 8496)"
Upon your search, the BLAST software will display the genome-specific blastn suite (Figure 2) with the title reflecting the organism name. The Search Set Database menu will display the associated databases. For assemblies that are not annotated, you will find a single database of sequences that comprise the assembly. In this example, there are 7094 sequences (emphasized with a red rectangle in Figure 2) that comprise the American Alligator genome assembly, ASM28112v4 . For NCBI-annotated assemblies, such as ASM28112v4, you will find additional databases of various transcript data. Moreover, there will also be genome-specific blastp suite for the proteins annotated on the assembly. To compare your sequence(s) against the genome, proceed as you would for any other blastn search, by entering your query sequence(s) in the search box as accession numbers or in the FASTA format. In this example the query sequence is NM_000249. If you have options, select the database to search or switch to the blastp suite for protein searches (by switching from the blastn tab to the blastp tab at the top of the page). What happens if there is no genome assembly for the organism of your interest? You will learn that by using the BLAST Genomes search box when the software presents you with a blastn suite for searching the nucleotide collection (nt) instead. Unless you change the option, your search will be limited to your organism. Search the Assembly database for your organism (for example, American Alligator[organism]). Access the record that you want, for example Algmis_Hirise_1.0. Use the BLAST search the assembly link under the Access the data section on the right side of the record to load the appropriate blastn suite.